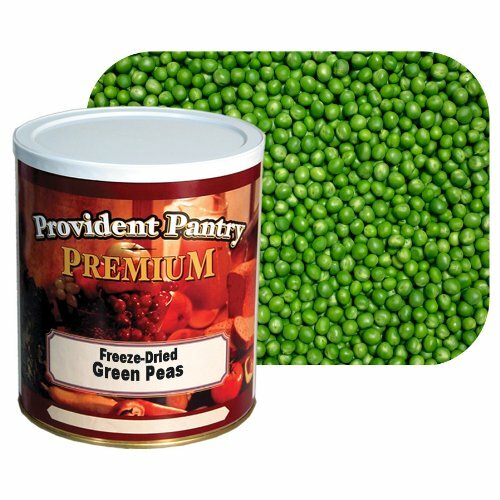 Our nutritious Emergency Essentials freeze dried green peas are processed and packaged for long-term storage, so you can enjoy the natural goodness of vegetables now or in the years ahead. Helps round out your emergency food storage supply. Re-hydration restores much of the original flavor, color, shape, and texture. Use for soups, casseroles, salads, stir fries, or as a side dish or snack. An excellent source of vitamin C and fiber and a good source of protein, vitamin A, and iron. Ingredients: Green Peas, Salt. Allergens: Processed in a plant that also handles milk, wheat, egg, soybean, peanut and tree nut products. Directions: Mix 1/2 cup of Freeze-Dried Garden Peas to 1 cup of warm water. Let sit 5 minutes until tender, and drain off excess liquid. Yields apx 1/2 cup of Green Peas for your favorite recipes or for a delicious dish by itself.